Lat Ya road on the Thon Buri side has a 200 meter stretch where several street food vendors are lined up. Probably the cities best vendor of glass noodles with crab or huge prawns in a small clay- or metal pot (Po/Krung Op Sen Wun), one of the better Pad Thai vendors in town, a variety of Isaan dishes like barbecued pork neck (Kor Yang), Som Tam (papaya salad) and Jim Jum which is my main focus here. The BTS stops nearby at Wong Wian. 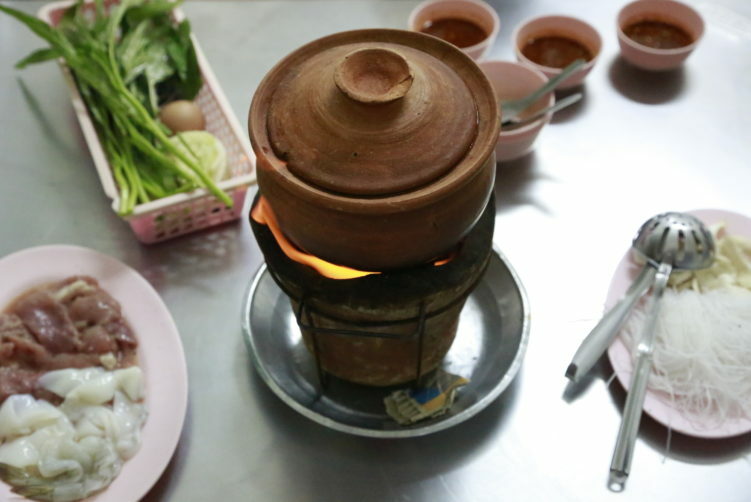 Jim Jum, also written Chim Chum and called Jeaw Hon in Isaan, is a hot pot with staple ingredients from the Northeastern part of Asia including Thailand, Laos and Cambodia. A lovely an aromatic dish. It is normally served with pork meat, prawns or squid. Or you just order a mix of it as I did. It comes with glass noodles (Wun Sen) from mung beans and plenty of herbs, especially sweet basil. The basic idea is that you throw the ingredients into the water/broth where it all cooks. You start with the herbs and give them a couple of minutes to flavor the broth that normally comes with galangal, lemon grass and lime leaves. Then yo throw in the Wun Sen noodles. By the way, Wun Sen noodles isn’t as sensitive to heat as rice noodles, so you really don’t need to be very precise in cooking them. Then you add some protein and mushrooms, and after another minute you grab a bit of everything to your plate and start eating. You also get an egg for poaching. 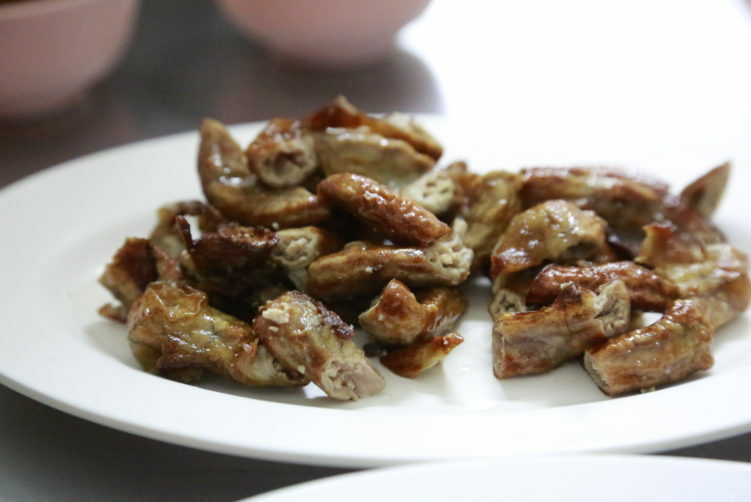 It comes with a sour and spicy dipping sauce (Nam Chim) – not very spicy, so most people would easily handle the spiciness. A standard Nam Chim is made by pounding garlic, coriander roots and sea salt before they add chillies and charlottes and give it a light crushing. Palm sugar, fish sauce and lime juice are then stirred in. The flavor will be more intense the longer you let the sauce sits, and should at least be prepared 1 hour prior to using. What I really appreciate with Jim Jum, except for the food itself, is the social setting of it. It’s interactive and such a great way to gather friends or family around a meal. Everybody participate in cooking the food a the table where people just throw in different things for sharing. It always comes with an enjoyable atmosphere. Jim Jum Lat Ya is a good spot to eat this dish. Som Tam, or papaya salad is a fantastic dish. 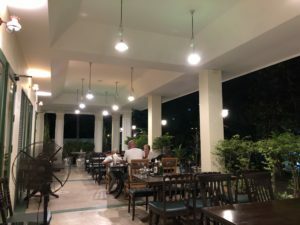 It’s a dish that comes in many variations, and most westerner or tourists is used to the version Som Tam Thai that comes with crushed peanuts and with no fermented crab. At Jim Jum Lat Ya they also have a cucumber version in addition to 20 other variations, so we went for that one. 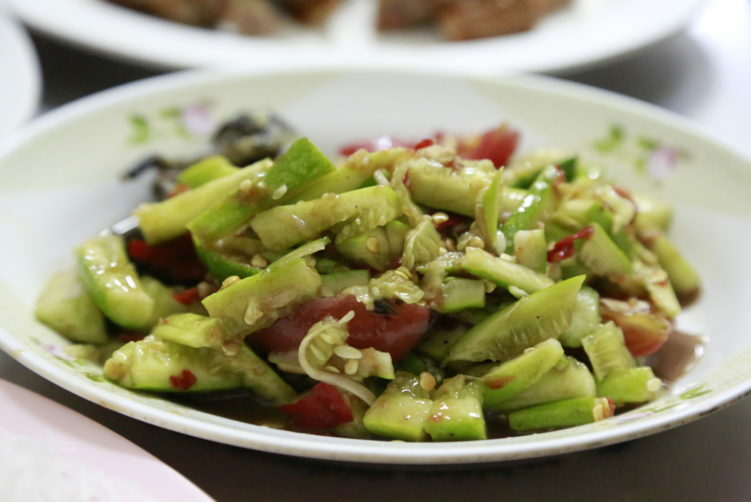 I still prefer the papaya salad version, but the cucumber version is a nice change, adding a lot of freshness to the dish. By the way, the Som Tam here is spicy as it should be, but not overly spicy as it can be some places, of course unless you ask for it. If I told you that Sai Yang, or the colon of the pig, is delicious, I know what kind of reaction I would get in 9 out of ten times. But I can assure you, when cooked and then barbecued, it’s a meaty and tasteful dish that everybody would like if they just stopped their brain from thinking that every intestines are crap. I am not a bi gan of the colon in noodle soups as it is just boiled, but when barbecued, I don’t need to be asked twice.It comes with an almost slightly more sour dipping sauce than the one for Jim Jum. Anyway, I’m not gonna use a lot of space on this one. But as always, if you gonna discovered the world, be bold. Kor Yang is barbecued pork neck. A favorite of mine when treated well. 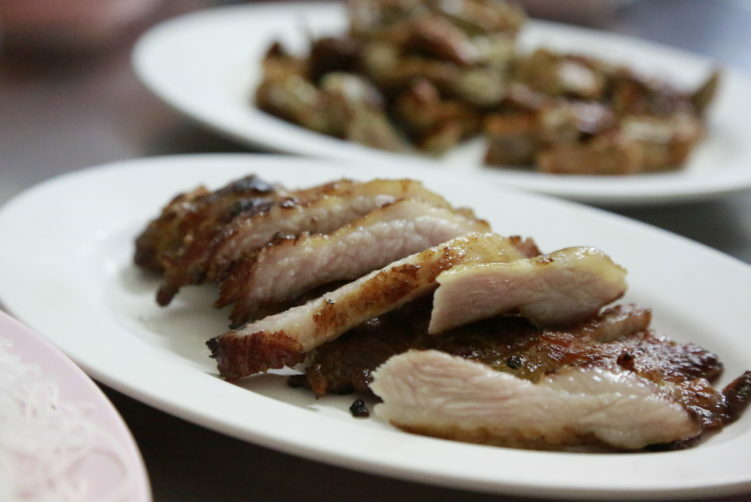 It has a small layer of fat that really makes it juicy, and here at Jim Jum Lat ya, they barbecued it to perfection. Stunningly good pork neck. What a meal it was for two. I went with a good friend of mine, Chart from Thonglor Travellers hostel and cafe ,who recommended the spot. After the meal we went to his hostel for a really good cheese cake with passion fruit and a great cup of coffee. It’s rather easy to get her from down town as you just take the BTS to Wong Wian station and walk 4-5 minutes from there. Anyway, the area is very good for Jim Jum and other Isaan dishes. This is the kind of spot where it becomes ridicules to talk about price quality ratio. It would be a winner anyway. If you look for restaurants close to where you are now, check out my Bangkok food map. click here Name: Jim Jum Lat Ya – there are several vendors along the street, mostly separated by the color of their shirt. Chim Chum is most likely a more correct spelling of the dish as Chim means to dip in, while Chum means to drop something quickly into liquid. click here Price: Rather Cheap. Jim Jum is 120 bath with mixed protein, the barbecued pork neck and colon is 50 bath each. The Som Tam is 30 bath. How to get there: Take the BTS to Wong Wian station and walk from there. It takes you 4-5 minutes. Lad Ya road on the Thon Buri side has a 200 meter stretch where several street food vendors are lined up. Probably the cities best vendors of glass noodles with crab or huge prawns in a clay pot (Po/Krung Op Sen Wun), one of the better Pad Thai vendors in town, a variety of Isaan dishes like barbecued pork neck (Kor Yang), Som Tam (papaya salad) and Jim Jum Lat Ya which is my main focus here. The BTS tops nearby at Wong Wian. See full review at StreetsideBangkok.